08.31.10 On July 26, 2009 Curt Brock did what many class players can only dream of. He went toe-to-toe with a grandmaster and proved himself equal to the task. Down a pawn with insufficient material to win the game mighty GM Perelshteyn offered Brock the draw and the players shared the point. We've tracked down this exciting game and bring it to you here complete with annotations courtesy of Fritz 9. 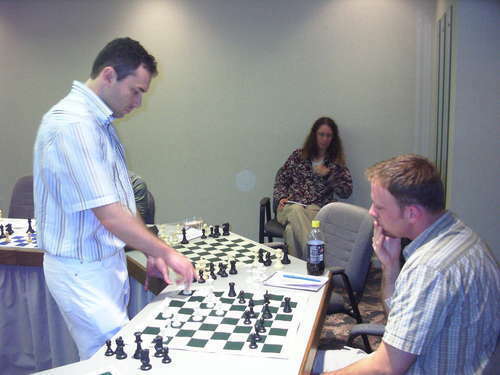 GM Eugene Perelshteyn makes a move in his game with Curt Brock during a simultaneous exhibition in Lewiston, Maine on July 26, 2009.
nice job curt! you can get the win next time!